I have been publicly organizing at Starbucks for nearly five years. The fact that I have managed to stay employed is no small feat. Since our 13-month trial against the company, Starbucks has been especially careful to fire outspoken unionists via policy violations, set ups, and pushing us to either quit in a fiery rage or go off and be fired for losing composure. The best position for organizing is being employed at the shop. Keeping your job is priority number one. Here is a brief account of one such time that I protected my job and won. 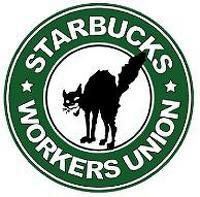 I worked at the Union Square Starbucks in New York City for years. While there, I helped develop a shop committee at the Astor Place store. After the committee went public, the majority of the shop members were systematically fired and the remaining members endured daily mistreatment from the anti-union management staff. As an act of solidarity, I decided to transfer to that location to further build the committee. I approached that store with a core focus of seeing an end to the store manager’s employment at Starbucks. He inflicted economic violence on my fellow workers; they were still looking for work after being fired for joining the union. Even a week of unemployment in a city like New York can mean homelessness. This is one of the many reasons that I take the firing of our members very personally. After my month-long battle, which included having the store transfer turned down and filing an Unfair Labor Practice (ULP) charge, I finally won. During my fourth shift at Astor Place I called an assistant store manager “shady” for refusing to leave proof that my vacation time had been approved. I told her that refusing to leave proof just confirmed my suspicion that management was hoping to do what I feared—schedule me so they could claim I did not show and fire me. Just hours after my argument with the assistant manager, the store manager came to the store to give me a write-up for “threatening and harassing a fellow partner.” Despite only receiving two other write-ups in over four years—one for being late and the other for a fight with a coworker who was homophobic to me—I was put on “final notice.” One more violation and I could be fired. This would be a less than climatic end to a career of fighting Starbucks from the inside. I filed a ULP about the write-up. I went into work the next day and coworkers told me that the store manager, district manager, and regional director had been meeting all day. During my shift, I was called into a meeting with the district and store managers. The district manager said, “I’ve been going over this corrective action the store manager gave you and I’m thinkingthat it was not serious enough to warrant a corrective so I will be removing this from your file.” I said, “OK, thank you,”and started to get up to go back to work. Then my store manager took out a new corrective action and said, “Do you remember anything strange happening with your till the last shift you worked?” I laughed and said, “That was two weeks ago, I don’t remember but I can go through my notes.” He then said that I was being written up for the till being $13.11 short. I told him I would not sign it and that in almost five years I have never had my till be short until coming to this store. I also told him I did not believe it, because he wrote all the other union members up for shortages too. I said that I would be happy to go to the Starbucks headquarters and meet with Partner Asset & Protection and go over every single transaction I did that shift while watching the camera footage to see where the money went. He said that was impossible. Then the store manager started to yell at me. The district manager took the write-up away and put it in a folder, saying “Well, I’ll have to look into this and get back to you.” They never gave me that write-up. Also, after a very successful call-in campaign and union pressure, the store manager quit. Now we can push forward and add this boss to the notches on our belt. The district manager took the write-up away and put it in a folder, saying “Well, I’ll have to look into this and get back to you.” They never gave me that write-up. Also, after a very successful call-in campaign and union pressure, the store manager quit. Now we can push forward.